Multi-Tiered Pro Gaming Table | OhGizmo! 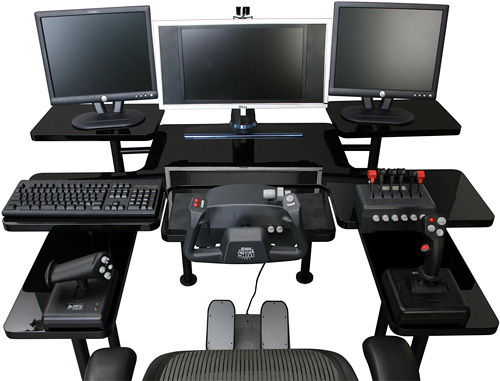 While being a professional PC gamer would definitely help you pay for this unique gaming table (not sure why they don’t call it a desk) even the most passive X-Plane or Flight Simulator enthusiast will appreciate the multi-tiered design which accommodates a yoke, joystick, throttle and other gaming peripherals. All 3 levels feature a glossy black enamel finish and there’s enough room for up to three 21 inch LCD monitors as well as other boring PC accessories like a printer. And like I said, if you’re a pro gamer who actually gets paid for playing, the $379 price tag probably isn’t that hard to swallow, but the rest of us might want to put this one on our Christmas lists instead. The glossy black enamel is a bad idea. It'll get scratched up way to easy. I'd consider buying something like that with out the enamel and if it was $250-$300.